Lorenzo Fraile is Doctor in Veterinary Medicine (1993) and PhD (1996) in the field of pharmacology at the Veterinary Faculty of Zaragoza, Spain. Afterwards, he worked as a swine and bovine practitioner for eight years (1996-2004) in private companies. From 2004 to 2010, he worked as a senior researcher at CReSA (Center of Animal Health Research) in Barcelona, Spain working in the field of epidemiology, pharmacology and immunology with a focus on bacterial and viral livestock diseases. Moreover, he belonged to the committee of veterinary and medicinal products (CVMP, EMA, London) during the period 2005-2007. The CVMP is involved in the evaluation and authorization of vaccines and medicinal products at European level. From 2010 to nowadays, he is working as an associate professor in Epidemiology and Pharmacology at the University of Lleida, Spain and he is also member of the European College of Porcine Health and Management. During his career, he has published more than seventy-two papers in peer-review journals. 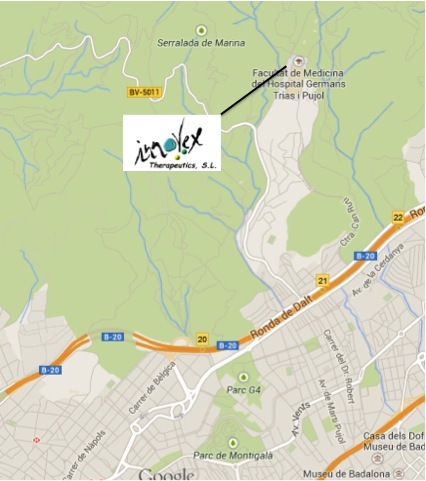 Dr. M. Montoya did her PhD in “Instituto de Salud Carlos III” in Madrid under the supervision of Dr. M del Val. Her PhD topic was the limiting steps in the classical MHC class I antigen processing and presentation in viral infections. Afterwards, she moved to work as a research scientist in the group headed by D. P. Borrow in The Edward Jenner Institute for Vaccine Research (UK), a centre focused in vaccine design. Scientific contributions by M. Montoya on dendritic cell function and immunity in the context of natural viral infections are considered reference papers in the field. In 2005, Dr. M. Montoya joined “Centre de Recerca en Sanitat Animal (CReSA)” in Barcelona, Spain as a group leader establishing a new line of research studying the interaction of influenza virus with natural hosts such as pigs but also in ferrets. Besides, she has designed new vaccines strategies in animal health. In 2014, Dr. M. Montoya moved to The Pirbright Institute as porcine immunologist. Dr. M. Montoya´s main interests are focused on the immunological mechanisms involved in virus-host interaction in viral diseases such as Influenza virus and African Swine Fever virus. This entry was posted in Sin categoría on 04/10/2016 by innovexther. Sergio Montaner, R+D member of ITSL has presented the recenlty published study on new advance in exosome-based PRRSV vaccine development at the IPVS & ESPHM 2016 Conference in Dublin. This entry was posted in Sin categoría on 10/06/2016 by innovexther. In this work, researchers describe the presence of viral antigens from porcine respiratory and reproductive virus contain antigenic viral protein in exosomes derived from animals that have overcome the disease. This research, which has been carried out in the past year in collaboration with the University of Lleida, reinforces the possibility of designing new vaccines for the prevention of this devastating disease in animal health. The work will be presented at the IPVS & ESPHM 2016 Conference in Dublin. This entry was posted in Sin categoría on 01/06/2016 by innovexther. CSO named President of the Spaniard Research group on Research and Development on Extracellular Vesicles (GEIVEX). 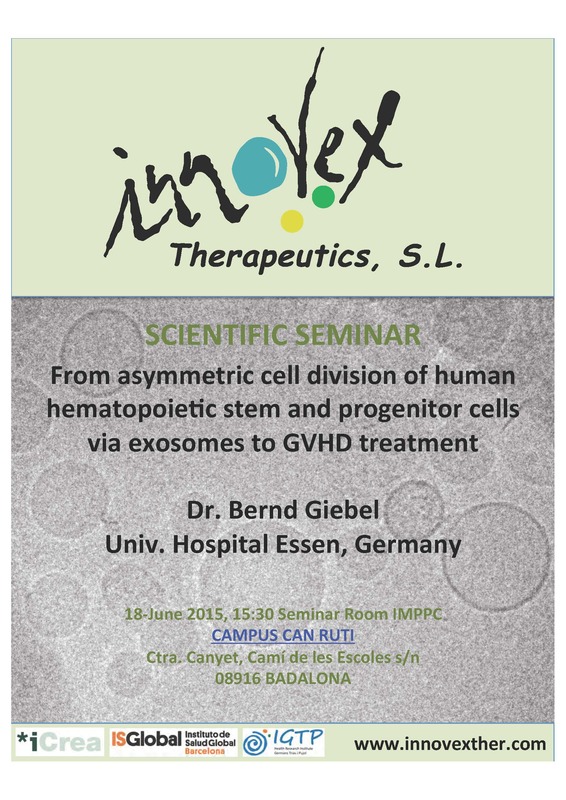 GEIVEX is a working group of Spanish researchers specialized in the field of extracellular vesicles. This group was created following the first international conference of the recently created International Society of Extracellular Vesicles (ISEV), held in Goteborg (Sweden) in April 2012. The conference brought together more than 600 research groups worldwide, including some of the Spanish groups working in microvesicles. There, the Spanish researchers decided to form a working group to contribute to the dissemination and integration of these small vesicles in the field of clinical diagnosis in Spain. GEIVEX was constituted as a non-profit Association in 2013. This entry was posted in Sin categoría on 08/03/2016 by innovexther. CSO of ITSL Coordinates a National Network of Excellenc in Research and Innovation on Exosomes (REDiEX) funded by MINECO. Research on exosomes is increasingly appreciated in the clinical setting and it is likely that it will impact even more in the future. Exosomes have been found to carry selective biomarkers of disease, playing an essential role in the transfer of information and molecules between different cells involved in the regulation of several physiological and pathological processes. This Network of Excellence for Research and Innovation on Exosomes (REDiEX) will focus its activity on strengthening the interaction between different Spanish groups that study this type of vesicles. REDiEX will integrate the experience and know-how of the different groups with a clear and innovative vision that will boost translational applications of vesicle analyses in human health. Laura Moya has recently joined ITSL as a Master Student. Laura Moya received her Bachelor’s degree in Medical Technology at Mississippi State University in Starkville, MS, USA. She went on to work as a Medical Technologist for 4 years at St. Jude Children’s Research Hospital in Memphis, TN, USA. She was then accepted into the Master’s in Advanced Genetics program at Universitat Autònoma de Barcelona and she is currently working on her Master’s Thesis at Innovex Therapeutics, S.L. From asymmetric cell division of human hematopoietic stem and progenitor cells via exosomes to GVHD treatment. This entry was posted in Sin categoría on 12/06/2015 by innovexther.